MY FIRST MORNING IN CALIFORNIA WINE COUNTRY, I woke up in the back of my truck to raindrops hitting my face. Apparently the racks on the roof of my Snugtop weren’t completely sealed. I was supposed to have been at a vineyard-pruning workshop at 7am, but the dark sky tricked me into oversleeping. It was already 9, and I’d missed the first workshop of the three-day Symposium for Professional Wine Writers at Meadowood, Napa Valley. So I went for a mountain bike ride instead. When I turned up at the welcome reception later that afternoon, I stank of cold sweat, my hair was helmet-matted, and I was still wearing bike shorts under a pair of Levis. Everyone else, including top industry writers like Karen MacNeil, Eric Asimov, Steven Spurrier, and Anthony Dias Blue, seemed to be more cognizant of the evening dress code: jackets for men and “wine country elegant” for the ladies. But hey, I was a ski bum at the time, working as a contributing writer for the regional outdoor publication Mammoth Monthly and studying wine on the side. I couldn’t afford the $250 (special rate) room arranged by the Symposium, so I slept in the back of my truck at a campground a few miles away. From the resort, I borrowed an umbrella and took a complementary wine region map. Each day after workshops, I went for a mountain bike ride — I pedaled unmarked single-track in Angwin and fire roads off Highway 29. Each night, I took a three-minute, barely-warm quarter-shower at the campground, slipped into formal attire, and returned to Meadowood for a five-course prix-fixe dinner in the ballroom. Volcanic eruptions that took place more than two million years ago deposited ash and lava in the Napa and Sonoma Valleys and created hills and mountains that are now famous for viticulture. More than 30 different soil types have been identified throughout California’s most famous wine region. 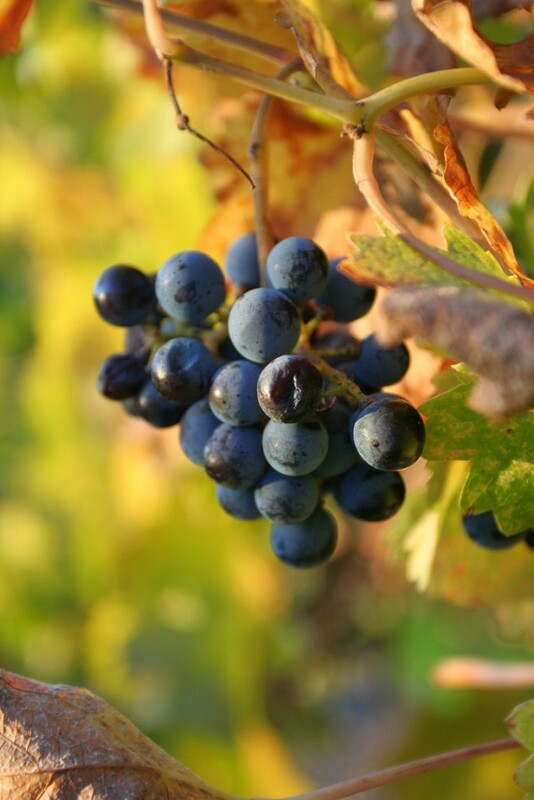 These conditions are ideal for growing many varieties of grapes…and for mountain biking. While most bike shops promote bicycle wine tours, for mountain bikers it’s in the hills and on the dirt that the best biking can be found. The Calistoga Bike Shop is especially helpful with directions and maps to trail riding. 1. For elevated views of Napa Valley, head up to the south summit of Mount Saint Helena in Robert Louis Stevenson State Park. The 10-mile round-trip ride on the trail of the same name starts at the summit of Highway 29 between Napa and Lake Counties. Look for the fire access gate about 8 miles north of Calistoga; this is the parking area and trailhead. The old jeep road climbs more than 2,000 feet before hitting the top. 2. Skyline Wilderness Park, near the town of Napa, has a system of trails for bikers and hikers (in addition to an 18-hole disc golf course and an archery range). The single-track is excellent and the best in the south end of the valley. Check in at the ranger booth for a detailed map. Trails are designated for different user groups. The wilderness park is a nature reserve and does not allow dogs on trails at any time. 3. 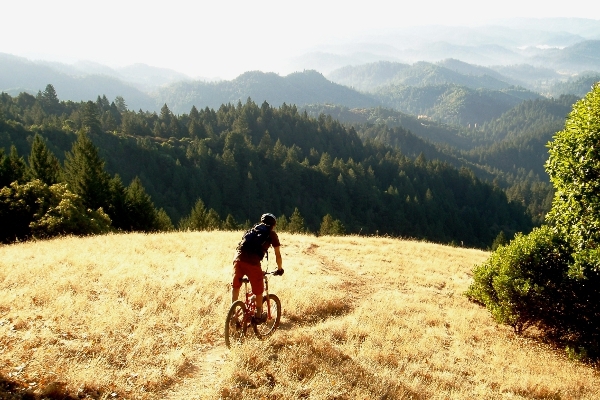 Just east of Santa Rosa is Sonoma County’s mountain bike hub, Annadel State Park. Tucked in the forested hills of Sonoma’s wine country, the park offers a network of beginner and intermediate cross-country trails, as well as advanced downhills. Miles of single-track and fire roads are well signed; off-trail riding is prohibited. 1. The tour and tasting at Schramsberg in Calistoga is remarkable. A guide leads guests through the historic underground caves and teaches about the champagne method. The caves hold two million bottles and stretch over two miles in length. Every American presidential administration has served Schramsberg at official functions since President Nixon’s toast to peace with China in 1972. Tour and tasting is by appointment only. Phone: (707) 942-4558. 2. The Sonoma winemakers at Michel-Schlumberger have a well-earned reputation for making wines with finesse, employing sustainable and organic farming practices. The winery uses a special breed of miniature sheep to help mow the permanent cover crop around the vines. They offer a variety of tour and tasting options, including a green tour and hillside tasting and an artisan wine and cheese tasting. 3. Located in the Los Carneros region, Artesa Vineyards and Winery features a visitor center set high on a hillside with gorgeous views of Napa, Sonoma, and San Francisco in the distance. The 350-acre estate benefits from a cool climate and ocean breezes, making it ideal for pinot noir and chardonnay production. The Mediterranean- and Spanish-inspired architecture and an artist-in-residence gallery combine to create a unique experience for tasting. Specialty tours are by appointment only. 1. Situated within Austin Creek State Recreation Area, Bullfrog Pond Campground has some great views of the Russian River Valley. There are also miles of hiking trails, which unfortunately are off limits to dogs and bikes. $25/vehicle. 2. The campground at Bothe-Napa Valley State Park is ideally located in the north end of Napa Valley between the towns of Saint Helena and Calistoga. From the park, it’s a short pedal to a lot of great wineries, restaurants, and shops. $35. 3. For a south-valley position, your best option is Skyline, which, as mentioned above, has a good offering of bike trails. And the Mexican grocery just down Imola Ave makes for cheap self-catering. $25 to pitch a tent. So you’ve graduated from ski bum status and can drop coin for even a non-special-rate room at Meadowood. I’m jealous. With at-your-call service and a “wilderness-y” setting, Meadowood is what I’d label the ultimate luxury wine-country retreat. The property includes a Michelin three-star restaurant, croquet, golf, tennis, a full-service spa and fitness facility, and a 4.5-mile nature trail. This post is proudly produced in partnership with Visit California.